People are busier than ever, and many do not have time to pick up a physical book. But, they will put an earbud in their ear and listen while they commute or wait for an appointment. What’s easier? Reading a book on your phone, or plugging in your earbud? Getting our written words before the reading public has always been the biggest challenge for a writer. A new social revolution occurring. According to statista.com, audiobooks grew from 3,000 to almost 60,000 over the last ten years. Audiobooks are winning over printed books and e-books in a huge way. Revenue went from $900 million in 2009 to $2.5 billion in 2017. Readers can listen to hundreds of hours on their smartphones, through their car radios, on their laptops, or through Google Home or Amazon Echo device. Choose from more than 35,000 books published each year. 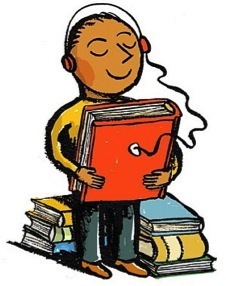 More than 67 million Americans now listen to audiobooks annually, according to the Audio Publisher’s Association. Audible, the largest producer of audiobooks, stated its subscribers would listen to over 2 billion hours of narration. ACX (Audiobook Creation Exchange) is a marketplace where authors and producers come together to collaborate on an audiobook. It is part of the Amazon.com group. Producing a book on ACX costs you NOTHING…up front. How ACX gets their fair share is the same way self-publishing companies such as CreateSpace get their income. They charge a percentage of your profits – 20% to be exact – on each audiobook sold. That means you keep 80% of the profits (if you choose to pay your producer). If you choose the other option of “Royalty-Share”, then you split the profits with your producer and pay nothing. 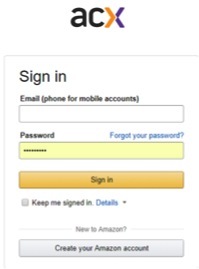 Sign in with your Amazon account. (If you want to keep your book account separate, create another Amazon account strictly for your books). WHAT IS A RIGHTS HOLDER? If you have self-published, you own the audio rights. If you’ve published through a publishing company, check your contract. Select “RIGHTS HOLDER” when asked during the sign-up process. Describe your book and type of narrator best suited for it. Your description can be the same as your back blurb or what you used for the print copy on Amazon. Prepare an audition script for narrators’ auditions. You will need 3-5 minutes of script. If you have several characters’ voices you want to portray, it’s important to include paragraphs where they speak. Click on Search in the top menu and select Producers for Hire. From here, you have access to thousands of narrators. Susan Keene, a mystery writer with Springfield Writers’ Guild said, “I was thrilled to find over 75,000 people attached to ACX who want to read.” It gives so many options, you’re able to find the one best suited to your book’s genre and style. Narrow your choices by using the parameters on the left side – genre, whether you want a man or lady to narrate and if you want an accent, the vocal style, and voice age. Do you want a guy with a deep, dark voice to tell a crime mystery or a storyteller voice who will animate the voices more distinctly? Location and language aren’t quite as important as it will be in English, and in America. However, if you want a more southern dialect, you can direct the reader toward a certain state. Compensation is important. It is recommended that first-timers use the Royalty-Share option. You may notice that some want up to $1000 per formatted hour. You won’t know how many hours they spend narrating until your book is completed. Click on any narrator’s name to navigate to their profile. There you will find other samples of their various-styled readings as well as their credits, awards and recognitions. Check their website, if they have one. See what other projects they’ve completed. If you like several, message them and ask if they would be willing to work with you or ask questions without making any offers. The narrators will read from the audition script you prepared. You will be notified by email when the narrator submits the audition. It will be available on your ACX dashboard. If you like what you hear, you click the button to “Make an Offer” to your narrator. Setting a parameter, you ask your producer/narrator to record 15 minutes of your book and send it back to you. You can either approve or give feedback on what you’d like different. Once you approve, the narrator will begin the project of recording the whole in the time allotment you’ve set. DO I PAY THE NARRATOR? You have the option to pay your producer/narrator up front and keep 80% of all sales that come in from your audiobook (ACX and AMAZON take the other 20% – that is how they get paid – like CreateSpace). The other option is to do a “Royalty-Share” – in which case you PAY NOTHING to the producer. You share 40% of the profits, the producer gets 40% of the profits and ACX gets the other 20%. The Royalty-Share is a win-win in many cases because the producer will promote your audiobook as much as you do. They are now invested in it. You are the Author. You still have full control of your book. If you don’t like how they have recorded a chapter or there are mispronounced words, request that it be corrected until you are satisfied. You decide the time parameters for the book to be done (usually 1-3 months). You can listen to each chapter on ACX.com dashboard and request changes along the way. Once the audiobook is finished, you are allowed up to two rounds of corrections. Prepare a sample for the world to hear. (If you don’t do this part, ACX/Amazon will take the 3-4 minutes of the first chapter). They prefer to it be from one section, not from different parts of the book. ACX distributes your book through Audible, Amazon (worldwide), and iTunes. It is up to you to market your book. 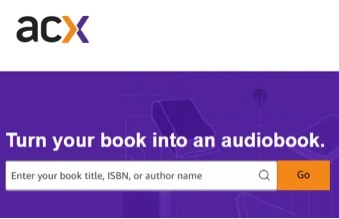 ACX helps by giving you 25 FREE codes for people to download a free copy of your audiobook. Send them out to your email list. Put it on Twitter. Make a meme and advertise on Facebook. Create a short video trailer and put it on YouTube, Instagram, or Pinterest. ACX also gives you the code for your website to advertise a free trial with audible.com. There’s nothing like hearing your words spoken with emotion and hearing your story come to life. However, the best part, no doubt, is getting paid for your work. John Cawlfield, President of Springfield Writers’ Guild says, “Working with ACX is the best choice I’ve made in my writing career. I’ve been able to sell four times as many audiobooks as print books.” When your audiobook sells, you will be notified by ACX through email, and also receive a monthly royalty statement. Should you choose to get paid through direct deposit, you can track your progress through your dashboard. Take the plunge. Get your book out on ACX! This entry was posted in Resource Tips and tagged ACX, audible, audiobooks, listening to books. Bookmark the permalink.